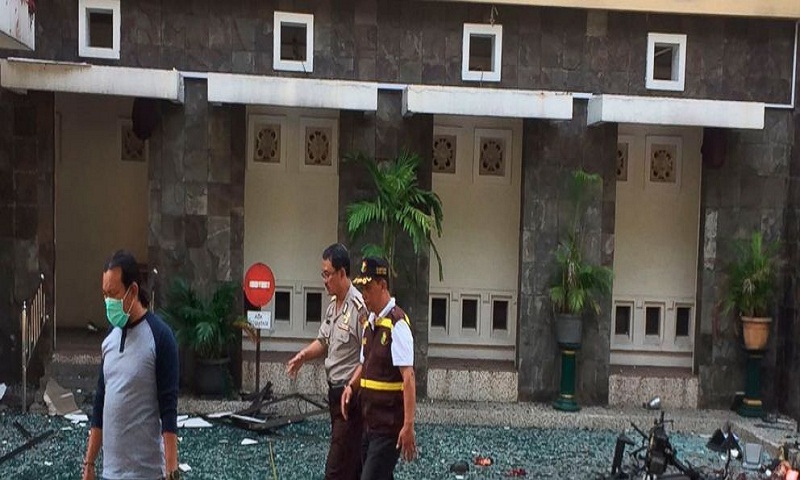 Suicide bombers on motorcycles and including a woman with children targeted Sunday Mass congregations in three churches in Indonesia's second largest city, killing at least 10 people and wounding dozens in one of the worst attacks on the Christian minority, police said. "At first officers blocked them in front of the churchyard but the woman ignored them and forced her way inside. Suddenly (the bomb) exploded," said a civilian guard named Antonius. "I saw two men riding a motorbike forced their way into the churchyard. One was wearing black pants and one with a backpack," said Samsia, who uses a single name. "Soon after that the explosion happened." The bombings were the worst since a series of attacks on churches on Christmas Eve in 2000 killed 15 people and wounded nearly 100. Religious minorities, especially Christians, have been repeatedly targeted by militants. Christians, many of whom from the ethnic Chinese minority, make up about 9 percent of Indonesia's 260 million people.